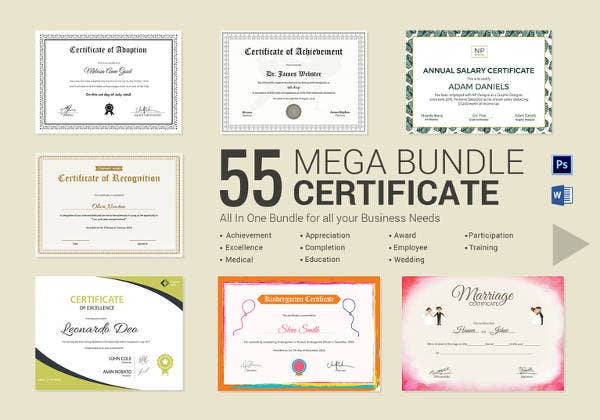 Certificates are used to mark very important milestones in a person’s life. This can be an accomplishment, an award, or just some significant event marking a new step. 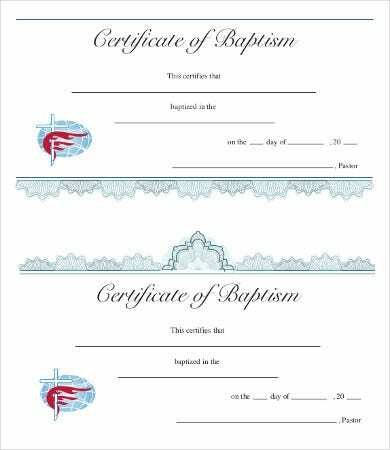 This collection of free baptism certificate templates is one great example for a significant event certificate. When people get baptized, it is said that they are a new being. In Christianity, especially, there is the concept of the old person dying and the new person being born. Depending on the denomination of the faith, baptism is done when one is an infant (common in Orthodox and Roman Catholic) or when one is old enough to make the confirmation of faith on one’s own (a mostly Protestant practice). In any event, a good certificate template will mark the occasion as a special and official one. Every sample on the list is offered free of charge, easy to download and print out. If you have a PDF-editing software, you might even modify the certificate to suit your needs. 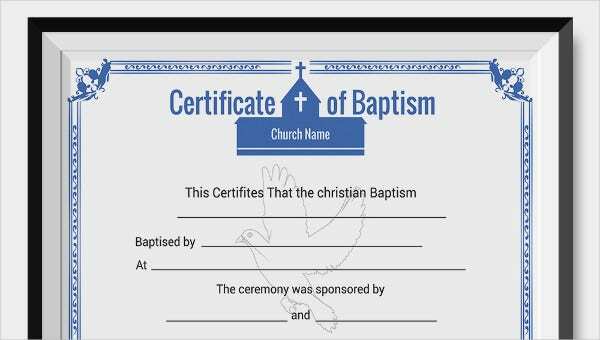 We have tried to include a Sample Baptism Certificate for the most common situations where it will be needed. 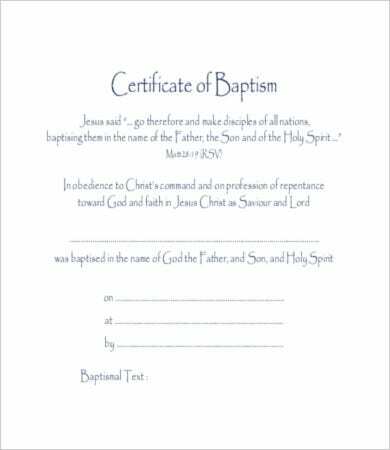 If you are in the Roman Catholic or Orthodox tradition of baptizing infants, use the Infant Baptism Certificate. For every other denomination that waits for a person to come of age and confirm their faith, all the other samples should provide what you are looking for. Some will be more decorated than others, but fancy bordering and lettering is usually besides the point. What matters is the event. All design is secondary to that, but you can definitely add those in with a good PDF-editing software or other digital paint and imaging tool. 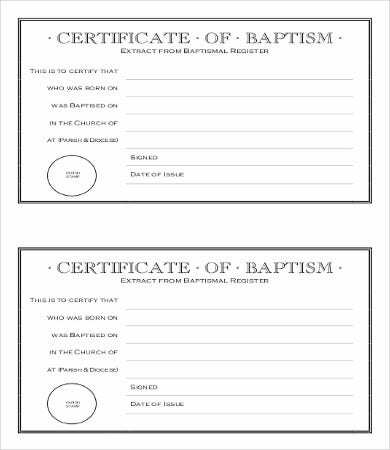 The Editable and Free Baptism Certificates are good places to start. They are simple, but elegant, and denote the solemn joy of the occasion very well. 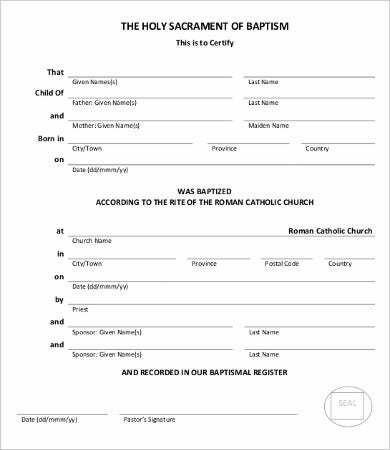 You can also take a page from the Printable Baptism Certificate and include your church’s logo, if it has one. Make the occasion one to remember and something worth framing on the wall. 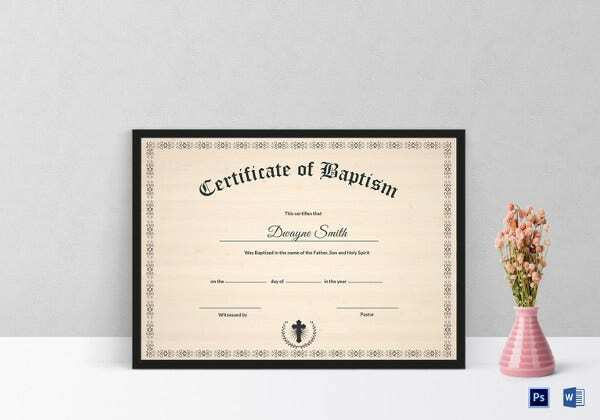 Baptism is by no means a small event, and a certificate is a good way to make it official. Aside from “welcome to the club” kind of certificates, other ceremonial documents might be awarded for other events. See Participation Certificate. 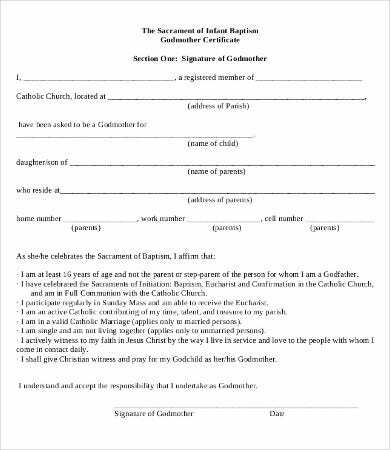 Why Do I Need a Baptism Certificate? In today’s world, however, almost everything significant requires a paper trail or a series of documentation. This is especially important at the start and end dates of certain periods of a person’s life. 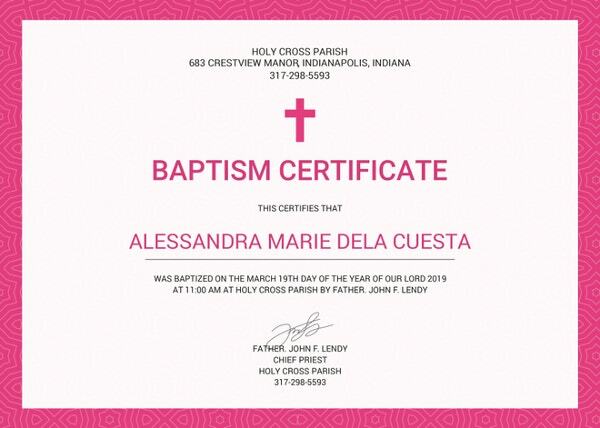 The baptism certificate denotes a change of status of a person. This “change of status” has to be acknowledged in official documents, especially if this status is something that can be registered by demographic surveyors. The marriage certificate is an example of this. 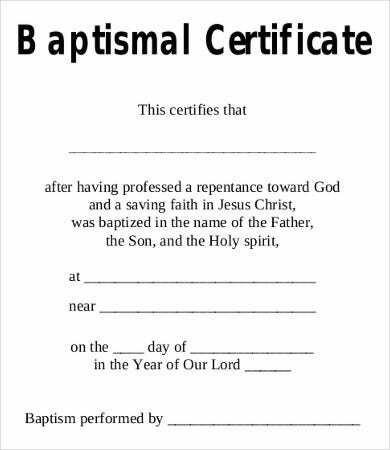 The baptism certificate can also act as a Membership Certificate, especially for baptist churches that require baptism as an integral part of inclusion into the fold. Whether required by an institution or merely as a way to formally acknowledge a crucial watershed point in a person’s spiritual life, you can use these certificates to welcome the person into the family.